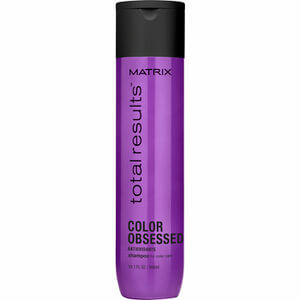 Protect coloured hair from fading and corroding with the Matrix Biolage Total Results Color Obsessed Shampoo. Innately rich with shielding additives, the concise ingredients work efficiently to enhance vibrancy and prolong appearance, providing an overall finish of sheen, polish and body. Aqua/ Water, Sodium Laueth Sulfate, Coco-Betaine, Sodium Chloride, Glycol Distearate, Dimethicone, Parfum/ Fragrance, Sodium Benzoate, Hexylene Glycol, Cocamide Mipa, Salicylic Acid, Carbomer, Helianthus Annus Seed Oil/ Sunflower Seed Oil, Guar Hydroxypropyltrimonium Chloride, Tocopherol, Linalool, Benzyl Salicylate, Limonene, Butylphenyl Methylpropional, Hexy Cinnamal, Citronellol, Benzyl Alcohol, Alpha-Isomethyl I M Hydroxide, Citric Acid (F.I.L. D43803/1).